There is really no one way to answer it. Really, it is your day and you may choose any pieces for your wedding music. The choice for wedding music is very personal. The first thing to decide is how personal you want your wedding to be, and that will give you direction in choosing wedding music. After many years of playing at weddings, I divide all weddings in three categories: traditional weddings, semi-traditional weddings, and non-traditional/unconventional ceremonies. 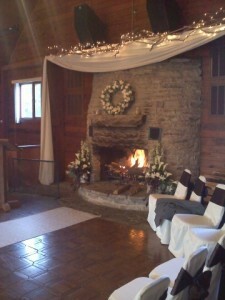 This division also helps me when I work with a couple on selecting music for their ceremony. Traditional wedding will most likely include prelude music, ceremony music and postlude music. It also will have some key components such as seating of the parents, processional of the bridal party and the bride, communion, presentation of flowers to the Virgin Mary, possible Homily, Unity Candle and recessional. For each of these aspects there are specific pieces of wedding music that are played. Moreover, certain pieces of wedding music are almost expected to be heard by the guests since the ceremony is traditional. You wouldn’t want to play a Beatles song during a communion. More likely, a piece such as “Jesu, Joy of Man’s Desiring” would fit here. In my opinion, in a traditional wedding you have some flexibility with music choice, but you also have to choose it from a set wedding music repertoire that has been around for years and is expected to be played. In a semi/traditional wedding you have a lot more room for deviation from standard wedding music repertoire, and yet you still keep the element of tradition. We played at many weddings where the music for the processional was a pop-tune that meant a lot to the couple, and yet, the wedding music for the Unity Candle and the recessional was more familiar to the guests. Speaking of guests, and it is my opinion only. Over the years, I observed a lot of guests during wedding ceremonies and how they behave at them, whether or not they are bored or not, looking at their watches or cellphones, or if they are completely engrossed in the ceremony and the couple. I think the choices of wedding music always made a difference in the way the guests were acting. If the program was put well together, and the guests got to hear pieces that they recognized or liked, it made it more interesting for them, verses the wedding music that was totally obscure for the guests, who ended up counting minutes until the ceremony was over. I do understand that wedding day is for bride and a groom, but it also involves guests who are spending their time, money and effort to be there for the couple, so it wouldn’t be a bad idea to make a day memorable not only for the couple but for their guests. Careful choices of wedding music is one way of doing so. The last category, the unconventional weddings are the ones where musicians play either the songs that have an exclusive meaning to the bride and a groom and quite often unfamiliar to guests, or some popular rock and pop music. These ceremonies usually do not last more that fifteen minutes, with a very short prelude and just as short of a postlude. At these ceremonies it can be challenging to combine classical wedding music and wedding music that was requested by the bride or the groom. I guess anything can be referred to as wedding music as long as it fits your ceremony set up. The choices are unlimited among wedding music in classical, sacred, pop repertoire. You only have to be careful of how you combine the different genres in one wedding ceremony, making sure it all fits together. 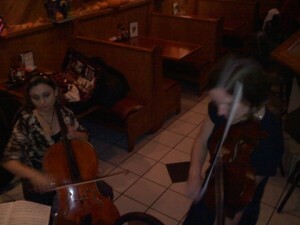 This was a trio consisting of violin, viola and cello playing wedding music for a ceremony. It has moved up my own personal list of favorite places. It is fairly far from Pittsburgh ( off either Donegal or Somerset from PA turnpike), but what a place! 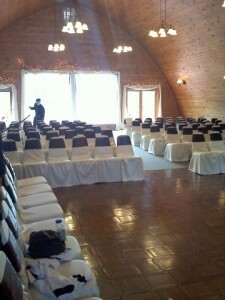 We played inside what looked like a gigantic barn room, with beautifully done woodwork and a fireplace. I don’t think I’ve met nicer people anywhere else, and we got so many compliments even though we didn’t play all that much, total of about an hour. The only downside – poor ventilation for the fire place. Within seconds of starting the logs, the smoke filled the room, setting the fire alarm off several times (tuned to a D – we checked! ), and making everyone’s eyes burn for a while. Still, it was wonderful and we felt really appreciated by those who were listening to us. Amidst all the hectic rehearsals, concerts, weddings, and teaching commitments, we try to have fun once in a while. 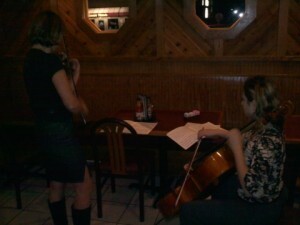 Last week the two of us played an impromptu concert at a local hang out in South Park called Dorido’s. My husband and his friends go there after their respective police shifts, to hang out, eat, drink a bit and have fun. I guess my friend cellist and I decided to expose them to some culture, giving them an earful on classical music to their already “gun-trained” ears… They seem to like it! If Johann Pachelbel was still alive today, he probably would have a heart attack after hearing many versions of his famous Canon, and all the debates over that piece. I have many clients, mostly brides, who ask me to explain to them what Canon is. First, here is the definition of a Canon from a musician’s point of view. 4) Finally, viola comes in a few seconds after the second violin, again, with the same melody.